November thru January Budding and Flowering. Water normally. Temperature in the range of 50-60 degrees F.
February to March Resting (55 degrees, infrequent watering). April to May Water thoroughly when potting mix begins to dry out. June to August Place outdoors in a shady spot. September to October Plant prepares to flower. Reduce length of daylight hours. Keep on the dry side and cool (55 to 60 degrees F) until flower buds form. Then increase water and temperature. 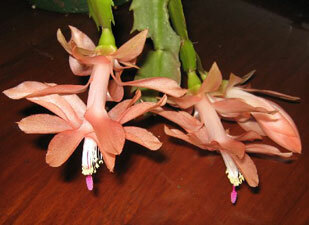 For more pictures and information about the Christmas Cactus refer to our January-February 2009 Water Miser Newsletter. Rhipsalis are great cacti for hanging baskets and are very easy to grow from stem cuttings. They will bloom in late winter and/or early spring. They need partial shade to bright interior lighting and a gritty, well drained soil mix. During the growing season the plants should be fertilized once every two weeks and well watered, but allowed to dry slightly before watering again. Water is held back during the winter to help in promoting blooms. Once flower buds start to appear, watering needs to be stepped up and the fertilizing resumed. For more pictures and information about Rhipsalis refer to our November-December 2008 Water Miser Newsletter. As small as a half-dollar coin to as large as a tree, there are over 300 different species in Aloaceae. 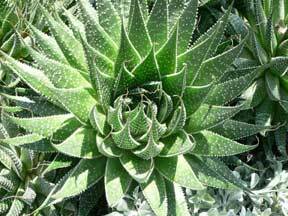 Aloe has been used for medicinal purposes for thousands of years. Aloe vera barbadensis is known as the medicine plant and kept in thousands of kitchens through out the world. It provides immediate relief for a kitchen burn. Aloe is also used internally. For more pictures and information about Aloe refer to our July-August 2008 Water Miser Newsletter. If you have never tried Aloe, now is the time to give them a try. I think you’ll be pleasantly surprised! Mammillaria Zeilmanniana (Rose Pincushion) is one of the most commonly grown Mammillarias. It has a purplish black body, which may grow to form a mound of numerous heads. For several months in the spring, a profusion of dark pink flowers are produced when the plant is only about 1/4 inch in diameter. This plant can reach a height of 6 inches with a spread of 2 feet. 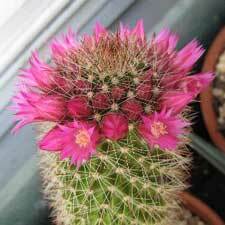 For more pictures and information about Mammillaria refer to our May-June 2009 Water Miser Newsletter. © 2009—2019 Sarasota Succulent Society.